You really can’t go wrong with a holiday gift box of goodies from Lush (A, $34.95, www.lush.com). The fresh, handmade cosmetics come in fantastic, brightly wrapped packages that are all dressed up for the holidays. This is an especially great gift for those who love a relaxing soak in the tub. There’s no better product for manscaping than the new Fusion Chrome Collection from The Art of Shaving and Gillette (B, $300 and up, www.theartofshaving.com). The shaving brush, stand and razor (power or manual) are sure to bring a new level of style to any man’s bathroom. Philosophy’s Holiday House gift box (C, $30, www.philosophy.com) will put anyone in the holiday spirit with the delicious smells of Eggnog Shower Gel, Cinnamon Buns Body Souffle and Sugar Cookie Lip Shine. Yum! The HAI Classic convertible flat iron hair straightener (F, $139, www.haiclassic.com) heats up in seconds and straightens even the frizziest and curliest hair. It takes up very little counter space and is perfect for anyone stepping out in the Bay Area fog. Ted Gibson’s Goodnight Replenish Hair Repair Serum (E, $200, www.tedgibsonbeauty.com) is absolute magic. The proteins and vitamins in this concentrated treatment turn your hair from straw to gold — and leave no residue on the pillow. For makeup lovers, Benefit Cosmetics offers a perfect winter bronzer/blush combo called 10 (G, $28, www.benefitcosmetics.com). The brow kit from Anastasia (D, $65, www.anastasia.net) will whip brows into shape with stencils, a perfect pencil and more. Article published in The San Fransisco Chronicle’s “Holiday Gift Guide” custom publication on December 5, 2007. 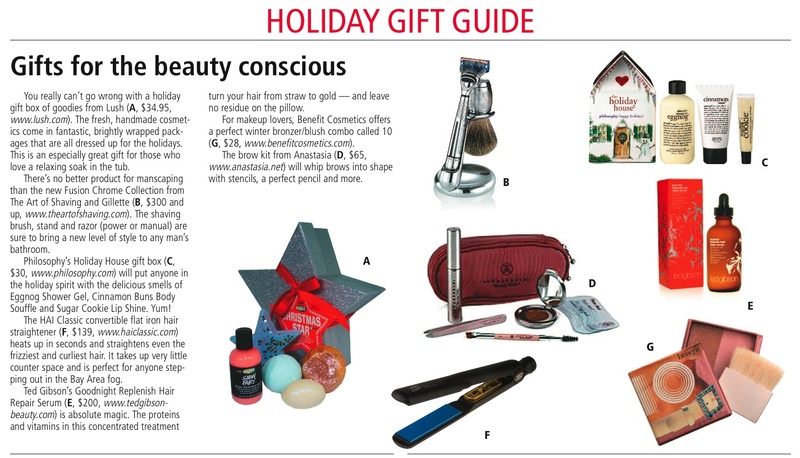 Download PDF of original article “Gifts for the beauty conscious” to view full layout with PHOTOS!